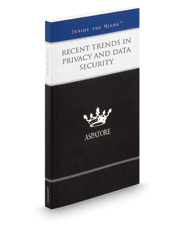 Recent Trends in Privacy and Data Security provides an authoritative, insider's perspective on helping clients understand how to store and protect their information. Experienced partners from law firms across the nation guide the reader through the laws governing data collection and storage and share their advice on keeping up-to-date on Federal Trade Commission requirements. These top lawyers offer specific advice on understanding the types of threats corporations are facing, how to comply with international rules for data transfers, and the importance of implementing proactive plans in the event of a security breach. Addressing a range of topics from cloud computing to the Gramm-Leach-Bliley Act, these experts highlight important developments in data security and share their insights on remaining in compliance with privacy obligations. The different niches represented and the breadth of perspectives presented enable readers to get inside some of the great legal minds of today, as these experienced lawyers offer up their thoughts on the keys to success within this dynamic field.